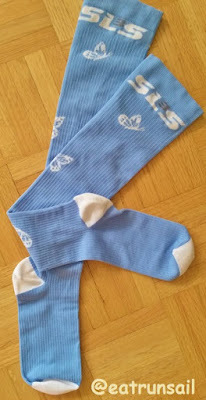 A few weeks ago I was the lucky winner of a pair of SLS3Compression Socks from a giveaway hosted by Wendy who blogs at Taking the Long Way Home. I chose these beautiful Butterfly socks as my prize. It was kind of a tough choice because they do come in some seriously beautiful colors! 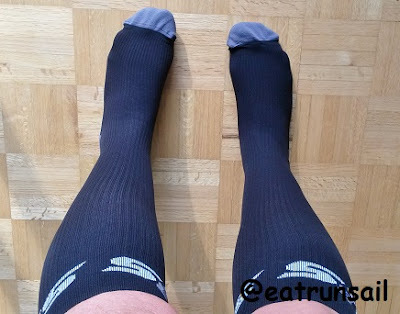 But I was so thrilled with them, and have loved running in them and wearing them for recovery so much that I accepted a pair of the SLS3 Allrounder socks to test and host a giveaway so that you can try out some for yourself. I do love compression socks and I wear them almost daily. I normally put them on first thing in the morning and wear them for walking, for running, for doing my strength training and bodyweight sessions, and I usually keep them on for recovery. I have been known to even sleep in them after particularly long or gruelling runs. On cooler days I also often wear them to work under slacks and have even been rumored to wear them in the Winter under black tights with dresses... shhhh! Which is why I chose the black Allrounder sock to test. These will hide nicely under black tights. And the Allrounder comes in some lovely bright colors, too. I know that those of you who love to make up cute running costumes will drool over these! The SLS3 compression socks really are unique in that they are designed with a graduated compression for increased blood circulation, muscle oxygenation and stability. There are slight differences between the Buttefly socks and the Allrounder socks, in both design and fabric, and suggested uses. I have also found that the Allrounder sock is a bit easier for me to get on and off... however, I really think that both of these models are much easier to get on and off than other popular compression socks I have tried. And both designs are very comfortable to wear for extended periods of time. The Butterfly socks and the Allrounder socks are designed to reduce muscle vibration drastically, resulting in less soft tissue damage and less sore muscles. I can certainly attest to that statement. I believe that the longer I can keep wearing them, the better it is for my legs... on days that I get in a morning workout, and will be home the rest of the day, I usually only have a quick sponge bath after my cool down, and put off my shower for several hours, just so I can keep wearing my compression socks longer. I am a firm believer in the benefits of compression. And both of these models come in compression socks or compression sleeves. So, if you are interested in trying out a pair of the Butterfly socks or sleeves, or the Allrounders socks or sleeves for yourself, enter the giveaway via the Rafflecopter form below. The giveaway is open to both Canada and the U.S.A., and the prize will be shipped to the winner directly from SLS3. UPDATE - A winner has been chosen and notified... the Rafflecopter form is not working properly today and so the winnner does not show here.... but it was LEA GENDERS. on your purchase at checkout. How do you use compression? Are you a fan of socks like me, or do your prefer sleeves? I love home compression socks have become more stylin'! When I first syarted wearing them I couldn't find any that didn't look like men's dress socks! I'd definitely pick the butterfly socks. So cute (and that's what I wanted to win from Wendy's giveaway too..congrats!). I'm a big fan of compression socks for recovery, and the brighter the color, the better! I've never tried sleeves, but I think I'd like them for warmer months to keep my feet cool. I'm a sucker for anything teal and I love butterflies. I'm a big fan of compression socks! I'm an ambassador for Pro Compression though so I won't enter the giveaway. I have noticed huge differences in recovery when I wear my socks. I would choose the Allrounder because I like a solid design more than a patterened one. The butterfly socks are so cute, I would love to win these. Compression helps keep my legs refreshed. I prefer solids over patterns, so the Allrounders sound like they're right up my alley. I'd choose the allrounder because I love the color choices! I love compression socks especially for long runs! The butterfly pattern is fun! I love the butterfly socks. I love compression. I very rarely use them during a run, but always after a long run. I swear by them. I even wear them to work for my shifts at the hospital! I do love these socks! I have the Butterfly and the AllRounders. They're both just perfect! Love compression...hate when I have to take them off to go places! I love compression socks! The butterfly one are cute, I love the green ones. I would definitely choose the butterfly socks because they are beautiful!!!! Would love to try the Allarounds! I think I would go with the allarounds. They all look comfy! The butterfly...they have a special meaning to me and I would love to honor some of my past patients while wearing them. I think you should develop this brand wide. You can succeed with such compression socks.